On North Street in Nazareth stands a building that represents the spirit of Martin like no other. 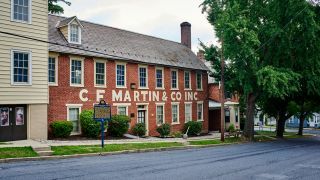 It’s the factory that founder Christian Friedrich Martin built in 1839 and it is where the company’s modern history really began. C.F. Martin was born in Markneukirchen, Germany, in 1796, and learned his trade from Viennese luthier Johann Stauffer. But when the time came for the apprentice to set up his own guitar-making business Christian Friedrich found his way blocked by a guild of violinmakers who lobbied local officials to prevent guitars being built by mere ‘mechanics’ - the derogatory term they used for anyone from a cabinet-making background who wanted to build instruments. So he emigrated to America, where he opened a shop in New York on 6 November 1833 and spent six years crafting fine instruments there. He loved the work but his family disliked big city life. Around 1838, his wife visited friends in Pennsylvania, where she found a German expatriate community thriving in rolling farmlands much like those of Saxony. This seemed the perfect ‘home from home’, so the family upped sticks again and moved to Nazareth, where they occupied a house and a small workshop that grew, as Martin’s fortunes waxed, into the sprawling brick-and-wood factory building that we stand before today. Though Martin stopped making guitars at North Street in 1964, the lower floor is still used as a warehouse for luthiery supplies, while the upper floors of the building have become an informal museum. Ushering us up the stairs, Martin employee Brendan Hackett shows us rows of original benches whose worksurfaces were worn concave by generations of Martin luthiers. “Some of these benches were worked on for 100-plus years,” he comments as we wander round the rooms where everything from dreadnoughts to mandolins were built. As we explore the now-silent rooms that would have been noisy with the sound of steel on wood for over a century, a tool catches our eye. It’s a template showing exactly where the bracing - the struts of shaped spruce that support an acoustic guitar’s top - has to be glued into place for optimum tone. But while X-bracing evidently worked well enough to impress Dolores, it was not in fact optimal for gut-stringed guitars and only rose to its full potential with the advent of steel-stringed Martins in the late 1920s. Its blend of strength and flexibility allowed the spruce top of the dreadnoughts, the ‘speaker’ of the guitar, to resonate freely enough to be loud and tone-rich - but was also robust enough to prevent a large-bodied guitar’s top from warping under the tension of heavy-gauge steel strings. This 175-year-old design feature is still at the core of the Martin dreadnought voice today, but back then it was revolutionary. This delicate structure of wooden struts also symbolises the hardest challenge that guitar makers with a famous heritage face. Bold new ideas become received wisdom and finally timehonoured traditions. But the world moves on. Consumers want new guitars to live up to the reputation of the famous old Martins produced in the company’s early days. But those new guitars need to be produced in numbers that dwarf the output of yesteryear’s workshops. And many of the materials used in the grand old guitars of the past are much harder to get hold of today, too. So how do you keep the essence of the Martin sound intact while increasing playability, affordability and performance for modern guitarists, playing modern music? We go looking for the answer a few blocks away from Martin’s old North Street home, in the company’s present-day factory. Here, laser cutters and high-spec CNC machines perform their precise work alongside luthiers handbending rosewood sides on heated formers very similar to the ones used 100 years ago. Look one way and you see a robot buffing a guitar body with inhuman precision. Look the other way and you see a craftsman shaping a neck with a tool that’s older than he is. On a balcony overlooking the bustling factory floor, sits a row of design offices. Inside, we find Tim Teel, who is Instrument Design Manager at Martin. He has to keep sight of how Martins are traditionally supposed to look, feel and sound, while trying to unlock extra performance from established designs. To illustrate the point, Tim shows us a set of so-called Liquidmetal bridge pins. They look unobtrusive and even classic, but are made of a high-tech alloy that is exceptionally good at transferring energy from the vibrating string straight into the guitar. The pins are going to be fitted to a new line of Martins that will be revealed in January, Tim says, along with other progressive features, such as titanium dual-action truss rods for lightness and composite bridge plates for yet more volume and sustain. But what about the essence of the original D-28, we ask? Has modern research uncovered why those 1930s dreadnoughts became so legendary for their sound and lasted so well? Tim said he found an important clue by reading the transcript of a speech on engineering made by C.F. Martin III - grandfather of Martin’s current CEO, Chris Martin - at a college, in which he described the traditional way that Martin prepared spruce tops for use back in the early 20th century. The method was slow in the extreme, but yielded great-sounding guitars. “The interesting part, for me, was when he described how they used to season wood,” Tim recalls. “Now, if you examine the cells of tonewoods like spruce, you’ll find heavy cellulose material inside that acts as a sponge. So it will take on moisture and it will release moisture, depending on atmospheric conditions, making the guitar less stable. In other words, the passage of time and changing climate conditions made the spruce more resonant, lightweight and resistant to climatic changes when it was finally made into a guitar top. By these means, patience and old-world know-how produced results that have never been bettered. Needless to say, Tim and other Martin designers have devoted a lot of research to replicating the same effect in the present day - but without the necessity of seasoning wood in the roof of a building without air-conditioning for a decade. The answer they hit on was torrefaction: a process of carefully controlled kiln-baking. This became the tech behind Martin’s Vintage Tone System [VTS], which is used on selected Custom Shop models - but also Martin’s Authentic Series reissues. And the latter project marks where efforts to capture the original essence of the Martin sound really venture down the rabbit hole. Jeff Allen knows a thing or two about old Martins. Along with Fred Greene, he was the driving force behind Martin’s Authentic Series of guitars. For the uninitiated, the Authentics are Martin’s most accurate recreations of hallowed models such as the 1936 D-45S. Martin now offer these in Aged versions, complete with painstaking lacquer checking and wear marks typical of 90-year-old guitars. They’re stunning instruments and near-perfect evocations of Martin’s revered pre-war guitars. Jeff formerly worked at both Fender and Gibson on their respective relic-ing programmes. He took the lessons he learned there about building aged guitars and brought them to Martin’s Custom Shop. “The idea was to make the guitars sound and look closer to ‘Nirvana’,” he explains. “And to most guitar players, that would mean a 1937 D-28. So it’s not brand new, it’s old, it’s been played a lot, it’s dinged-up, it’s dirty, it’s cracked. It smells good and it sounds and feels amazing. So what we wanted was to find a way to recreate as many of those attributes on a brand-new guitar as we could. Like Tim Teel, Jeff realised that the answer lay in somehow imbuing the woods they were using with the character of old spruce tops. “There was no way to make this guitar sound old with green wood: it’s just impossible. Or even 10-year-old spruce that had been downstairs in our acclimating room in perfect conditions for a decade. We built some test guitars from that and they still didn’t sound as close to an old ’37 as we wanted. “So I kinda went back to the drawing board. One day I borrowed a microscope and I started looking at pieces of wood from a 1936 Martin that someone had sent back to us for repair. We keep all the old parts that we take off damaged vintage guitars, so I started collecting a stack of old spruce tops, all from the 30s. I started looking at the cell structure of every single one of them and then I compared them to the cell structure of some new torrefied spruce that Tim Teel had been working with. And I thought: ‘Man, this is not exact but it’s very close’. “Although that was a good start, Tim and I soon realised that the industry standard torrefaction process was too aggressive. What we really wanted was to target the ageing effect, so we could emulate tops made in the 1930s. Not the equivalent of 200 years old, like you get with aggressive torrefaction - because while ageing like that does benefit the tone, the brittleness of the top becomes a risk factor: you might end up with bridges popping loose in 10 years or problems with cracking. 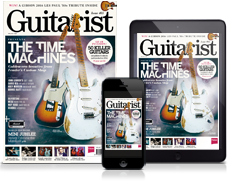 So by listening to voices from Martin’s past, then analysing the very fabric of the old guitars and finally applying new technology to the problem, Jeff Allen and his colleagues found a way to bring the sound of the legendary 1930s dreadnoughts back to life in Martin’s Authentic series guitars. But had they isolated the true source of the Martin sound? Well, while the results were impressive, they weren’t the whole answer because Martin have always had a knack for building a certain special sonic ‘something’ into all of their standard models, not just high-end reissues with torrefied woods. However, it was clear that some of the construction hallmarks of the 1930s dreadnoughts that Tim and Jeff had examined in such close detail could also help Martin take their mainstream guitars to a higher level. This idea became the basis of the biggest overhaul of Martin’s Standard Line guitars since the 1980s - the Reimagined Series. “The issue we ran into on the Standard Line was that we really hadn’t changed it much in quite a while,” Martin’s Director of Product Fred Greene recalls. “We worked on the D-18 a few years ago and people seemed to really like it. We went to a more modern neck shape and did a few other things. But we had avoided touching the rest of the line and it really hadn’t changed much since the 1980s. “We’d built a million guitars in that time. So plenty of those guitars are out in the field and eventually our dealers were competing with our own used product. So we knew we had to make some changes and we knew there were new players who wanted something different.” The problem was where to start. Deciding what players might want from a 21st-century Martin was a potential minefield - stand still and other guitar brands gradually overtake you in terms of innovation and performance. But make changes that alter the familiar voice of landmark models such as the D-28 and you risk total disaster. “We wanted to get the guitars to where they had a more modern feel but a vintage vibe at the same time,” Fred Greene says. “It’s a weird tightrope to walk. So we thought, ‘let’s look at what people ordered - what options are they choosing?’ And everybody wanted forward-shifted, scalloped bracing,” he says, referring to the bracing style used in pre-war Martins such as the 1932 D-28, in which the thickness of the bracing was pared back to a lightweight minimum and positioned quite far forward, which imparted extra-resonant properties to the top. Likewise, it turned out that the styling details that modern players liked most in retrophile 2018 were all out of the 1930s Martin catalogue, too. When it came to playability and feel, however, the situation was reversed. So the leading edge of guitar design at Martin today is a taut blend of old and new. In fact, the ‘Yin and Yang’ struggle between tradition and change has been a feature of guitar-making here since the original C.F. Martin decided to leave hidebound Germany behind and set sail for America. Dynamic range is certainly a big part of the Martin magic, but arguably it’s more subtle than that. The technology that helps the luthiers evoke the Martin sound may change over time, but the goal remains the same. It’s a thought that strikes us afresh as we watch Brendan Hackett examine a spruce top for hidden flaws by shining a light through it with a ‘candling’ machine. Though cutting-edge equipment aids the process, the luthier’s eye still scans the grain for faults with the same careful scrutiny as in the days of the classic 30s dreadnoughts. And this institutional knowledge is where the real continuity in Martin’s sound comes from. Down on the factory floor, when a job needs to be done that requires feel, experience and careful judgement there’s a person, not a machine, wielding the tool. And some of the people working here belong to families that have worked at Martin for generations, passing along the skills to sons and daughters. That shared experience, stretching back through the decades, leaves its mark on every aspect of how all guitars are made here, not just the high-end stuff. And thus the whole becomes greater than the sum of its parts. As we were passing through the old factory on North Street, our guide Brendan remarked that some of the antique tools on display were only retired from factory use six years ago. Martin’s like that: nothing useful is ever thrown away.